Fire hydrants are not protected? 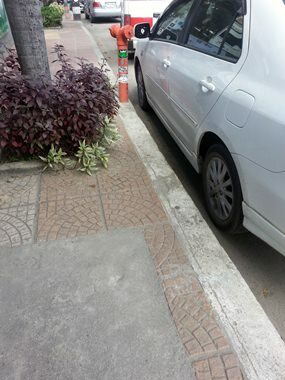 I was walking down Nimmanhaemin Road today to visit one of my favorite restaurants and I was rather surprised to stop and see this car parked directly in front of the fire hydrant. But what surprised me even more was that there were no red “No Parking” lines on the kerb. In most countries it is not only illegal to park in front of one but there are much more severe penalties for doing so. Rightly so since if a fire were to break out people could lose their homes, businesses and lives if access to the hydrant were blocked. Can anyone explain to me if this is the law here as well or if the hydrants are not protected? If not then why not? Perhaps for the same reason that emergency services such as ambulances are not given free access to the roads. I am attaching a photo of the smallest motor scooter I have ever seen. It must have been much more than half a metre high. 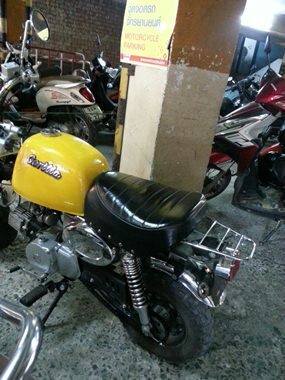 It had no licence plate and unless the owner took his helmet with him no helmet either. Surely this can’t be street legal? Do any of the Chiang Mai Mail readers know about these scooters? Can they be driven on the streets? If so, how? Does one need a driver’s licence? Is insurance required? I am not so interested in buying or using one as I shudder to think what would happen if someone hit me, it is so short the driver must be hard for those in cars and trucks to really see. Can this really be legal? Can I offer some suggestions for future event in Maejo University. They should close the road leading to the event ground and have songthaew to ferry people to the event. We were stuck in the jam (riding motorcycle) for almost 2hrs before reaching the event ground and another 1half hrs jam for getting out. The mass release of lantern could be divided into 2 session. 1st release at 8pm and 2nd release at 10pm, so that more people can get to enjoy the scene. Hope that my suggestion can be put to use. 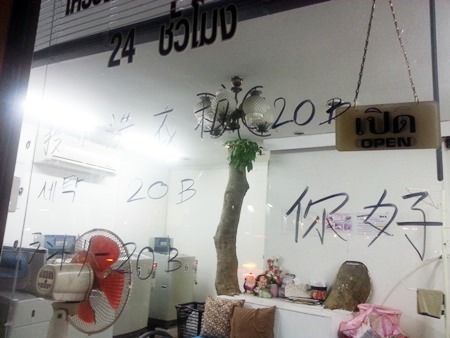 Scribbled on the glass window of a local Laundromat are Chinese characters. I cannot read it but can guess what it says easily enough. There are many Chinese around, everyone complains. Myself included. They stand in the middle of the road. Why they do this I will never be able to understand. They take photos of random things, apparently if it was in this famous movie they take a photo of it. According to many shops they do not spend any real money but they seem to be everywhere. I must confess that except for the fact they seem to like to stand in the middle of the road and they have terrible driving skills and seemingly no common sense when it comes to driving at all I have not yet seen any of the awful behaviors that they have become famous worldwide for. I do notice that they all wear helmets when they rent motorbikes, passengers included. But of course the way that most of them drive, these little cheap rental helmets won’t do a lot of good if they have a bad accident but it is one step above the many locals and foreign (non-Chinese tourists) who do not wear helmets at all. I am not as anti-Chinese as many of the other expats I know, I realize that these people are new to tourism and will eventually learn some day. Besides, many nationalities are more than infamous for their bad behavior abroad and as I said to a friend of mine who comes from a country particularly famous for troublemaking “People who live in glass houses should not throw stones.” He didn’t seem to understand my point at all. Anyway, this isn’t a rant just thought it was interesting to see signs in Chinese now. I was in Pattaya a year or so ago and the signs were in Russian. Last issue you ran a letter from a man, clearly American, who was unhappy with the way things were working out here and seemed to assume that the Thai system was the same as the United States and that majority rule was somehow the norm. Well, if we are to be honest, it is often not the norm in the United States but that is beside the point. The point is that Thailand is a Parliamentary system with multiple parties. Unlike the United States the Prime Minister is not directly elected as the leader of the country but is elected as the leader of her party and the party garners enough seats, either on its own or through alliances with other parties, to gain a majority and is then appointed Prime Minister. In a multi-party system like Thailand the alliance method to obtain a majority of seats in Parliament is the norm rather than the exception to the rule. Perhaps it would be better before expats make commentary on local politics they learn more about the system and how it works first.